One size unisex style headpiece fits most Adults and Teens Age 12+. Adult-sized Cute REINDEER MOOSE ANTLERS HEADBAND measures approx. 10-inch (25cm) Tall. 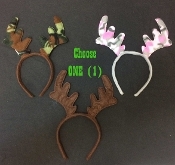 Our fun and festive fuzzy holiday themed headpiece features a solid felt covered flexible plastic headband with REINDEER ANTLERS, featuring your choice of PINK or GREEN CAMOUFLAGE Print, or Solid Color BROWN. The perfect Rudolph the Red-Nosed Reindeer inspired UGLY CHRISTMAS SWEATER PARTY costume accessory for any of Santa's Elves and other helpers! Great crafts projects base to wear as is, or decorate with jingle bells, ribbons, miniature Christmas ornaments, etc. Material: 100% Polyester Felt covering flexible Plastic headband. Care: Spot Clean only with mild detergent - DO NOT WASH.
-Wear as is, or decorate with jingle bells, ribbons, etc. *WARNING: Not intended for children under 4 years old.